Create a SharePoint communication site to share news, reports, status, and other information in a visually compelling format. Communication sites are responsive and can be viewed from anywhere on any device. When you create a communication site, an Office 365 group is not created. Should I create a communication site or a team site? Use a communication site to broadcast information out to a broad audience. With a communication site, typically only a small set of members contribute content that is consumed by a much larger audience. If you want to collaborate with other members of your team or with others on a specific project, a team site is the better choice. With a team site, typically all or most members can contribute content to the site and the information is limited to only the members of the team or project and specific stakeholders. 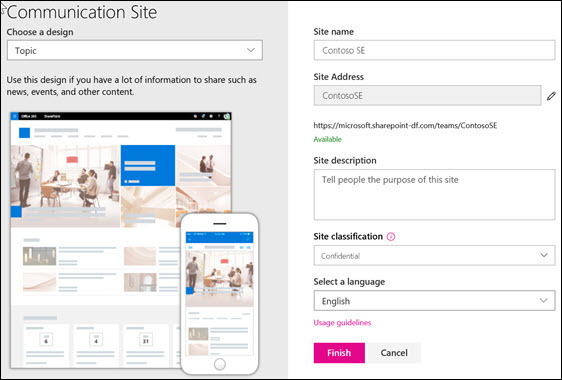 If your plan is to associate the new communication site with a SharePoint hub site, you can streamline the process by first navigating to the hub site and clicking the Create site link in the top right corner there. The new communication site will automatically be associated with that hub site. If you don't see the + Create site link, self-service site creation may be disabled in Office 365. Contact the person administering Office 365 in your organization to create a team site. If you're a tenant administrator, see Manage site creation in SharePoint Online to enable self-service site creation for your organization or Manage sites in the new SharePoint admin center to create a site from the SharePoint Online admin center. Give your new communication site a name and, in the Site description box, add some text that lets people know the purpose of your site. For SharePoint Server 2019, your system admin must enable and install language packs for this option to be available. Caution: Once you select a language for your site and create the site, you can't change the language to something else later. Click Finish. Your site will be created and will appear among the sites you're following. Your site will not inherit the permission settings or navigation of other sites. To share your communication site with others, see Share a site. Note: If your screen doesn't match the images above, it means that your administrator has site creation set to the classic site creation experience. See Which version of SharePoint am I using? for more details.